Dr. Paul G. Swingle is a Vancouver based psychologist and an expert in the field of neurotherapy. He is the author of the ClinicalQ and BrainDryvr software suite published by the BFE and will be presenting an upcoming webinar on Post Traumatic Stress Disorder. We recently spoke to him about his work in this area. What are the advantages of using neurotherapy as part of the treatment for PTSD? Neurotherapy can normalize or improve the brainwave architecture - that is, the way the brain is functioning - and then we typically combine that with some other psychological process for helping the person deal efficiently with the overwhelming emotions associated with the exposure to the traumatic event. It marries well with other kinds of therapy whether its experiential, EMDR, cognitive behaviour and so forth. Once the brain is functioning more efficiently, then it just markedly enhances the efficacy of these other procedures. When exposed to the same traumatic experience, why do some experience PTSD, while others do not? 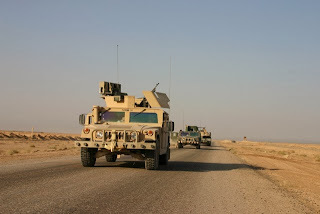 When I was treating combat veterans at Harvard Medical School McLean Hospital, we had situations in which we would have 3 or 4 veterans, one of whom was hospitalized with PTSD. He was disabled by the event whereas although all of the other people experienced the same thing and might have such problems such as bad dreams, they weren't disabled by the event. The difference with the person who was disabled was his neurological condition prior to walking into the combat theatre. So, we know one of the areas that we can work with in terms or increasing stress tolerance, but what about the damage that's been done - namely the post traumatic stress disorder - and that is a marked impact on the ability to regulate emotional reactivity. The flashbacks, and all of the rest of it, are associated directly with neurological conditions that we can identify when we do EEG assessments. And if we can identify it, then we know where to go to help correct the problem. How does the ClinicalQ assessment work? The ClinicalQ is an EEG assessment that measures brain activity at five critical locations. The results of the assessment are then compared to a clinical database that is remarkably accurate in terms of indicating why a person is coming to see us. I saw a client the other day - a young man who had been exposed to a recent severe emotional stressor that triggered a predisposition to depressed mood states. When I explained this to him, his jaw dropped to the floor. How could I possibly know that from looking at brainwave activity? Well, the brain tells us everything. If you've been exposed to a severe emotional stressor recently, it is very likely that the brain is going to show the effects. And if you have a predisposition for a certain disorder such as depression, exposure to severe emotional stressors may likely trigger that condition. Do you think that combat veterans - most of which are young men - are hesitant to seek treatment for PTSD because of stigmas that exist? That's really a crucial point. Decades ago, when we were dealing with PTSD there was a presumption of a weakness of character and that an individual that was disabled by the exposure to this severe emotional stress had some kind of deficit. We know now that there are neurological conditions that render us more susceptible to one type of disorder than another. With regard to post traumatic stress disorder, there's a very specific area of the brain that's associated with this vulnerability. So, if the client was a police cadet, prior to going into the policing theatre we would have a look and see if he was neurologically vulnerable and we would do some preventative neurotherapy to better prepare him for the severe stresses of police duty. The focus is on brain functioning - it's exactly what we would do for an Olympic level athlete, exactly what we would do for a CEO of a large company. It's just making the brain more efficient to deal with severe stress. It has absolutely nothing to do with strength of character or mental illness or anything of that nature. 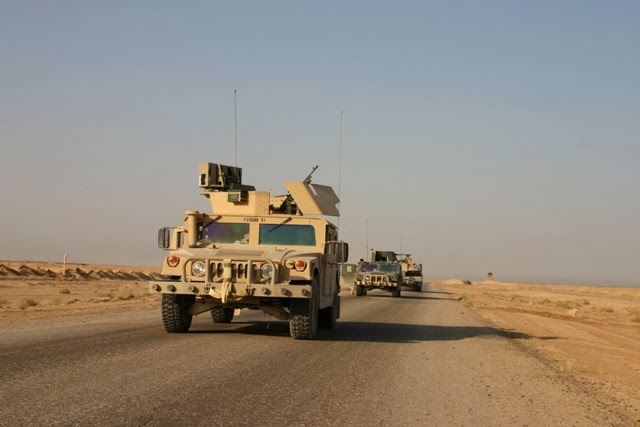 Are there other therapies that are effective with post traumatic stress disorder? As I said before, all therapies marry perfectly with neurotherapy. I do a lot of hypnosis for these kinds of conditions. Once you get the brain so it's functioning efficiently you can use hypnosis for trying to modify the core emotional belief that gets triggered in these post traumatic stress disorder conditions. A good example is the feeling that you're not safe. One of the situations that we get with get severe stress...automobile accidents are a good example of this. When you're driving through an intersection and you have the green light, somebody t-bones you there's a situation where something came right out of the blue. So, after you get all of the physical things sorted out you still have this angst about the world not being a safe place and that's a core emotional belief - its beyond the arena of words. So hypnosis is often an extremely efficient way of having the person reorganize that emotional belief. Do you have advice for PTSD sufferers that might not have access to neurotherapy? A lot of it depends on extent of disability. If you're dealing with somebody who has full blown flashbacks where they become absolutely incapacitated and they're not present, then the notion of giving them advice or home treatment is completely misguided because you need somebody to be able to shepherd the person through all of that. For lesser conditions, we use things like my sweep harmonic, for example, which is something akin to EMDR, but it uses sound. If you listen to that sound while you are trying to make the fear as intense as possible, you'll find that it blows it away. So any situation in which the individual is trying to feel, what every cell in their body is telling them to avoid, under conditions in which it is manageable is a positive treatment. For military veterans, it is best to inquire with their case worker who should be familiar with these options. The BCIA (BiofeedbackCertification International Alliance) website provides a list of practitioners that have been certified in neurofeedback. You can learn more about Dr. Swingle and his methods on the BFE Website or by visiting the Swingle Clinic website. In an upcoming webinar, Dr. Swingle will discuss his approach to treating PTSD. Any questions can be directed to Dr. Swingle's BFE Team at blueswingle@gmail.com. We invite you to visit us at the ISNR Conference in Dallas! Dr. Francois Dupont will be on hand to discuss BFE neurofeedback software suites and will be demonstrating the Monastra-Lubar ADHD Assessment software at the Thought Technology vendor seminar. Dr. Dupont is one of the creators of that suite and has worked on a number of other neurofeedback suites including his own Integrated Neurofeedback. Over the years, the BFE has devoted a lot of resources and effort to the creation and adaptation of research, assessment and training methods. We have at least 35 different software suites, big and small, that cover a wide variety of topics. Some are far encompassing, like Dr. Robert McCarthy's Integrative Medicine Suite for starting up a state-of-the-art integrative medicine practice, and others are niche-specific, such as Dr. Catriona Steele's Dysphagia Suite for speech-language pathologists to treat patients with difficulty swallowing. Getting the word out on all of these packages can obviously be difficult or confusing. Most clients have heard or are familiar with our "big three" - Setting Up For Clinical Success Suite (Thompsons Suite), Optimizing Performance & Health Suite (Sue Wilson Suite) and the ClinicalQ & BrainDryvr Suite (Swingle Suite). The popularity of those methodologies tend to overshadow our smaller, simpler suites. As wonderful as the big three are, they don't completely cover all the clinical bases. There are still many simple, smaller suites that empower a therapist to easily evaluate or treat a specific patient condition. This post is devoted to a few of the BFE's smaller suites, that can easily be integrated into a clinician's practice as an additional treatment tool. We have included a sample of three below. Have any clients that suffer from that persistent background ringing or roaring in their ears? The Neurofeedback for Tinnitus Suite provides a simple treatment methodology for reducing that sensation via neurofeedback training of alpha/delta ratios on several sites of the head. There is the choice between the 30-minute training protocols, based on research, or free-flowing sessions that end whenever the clinician decides. 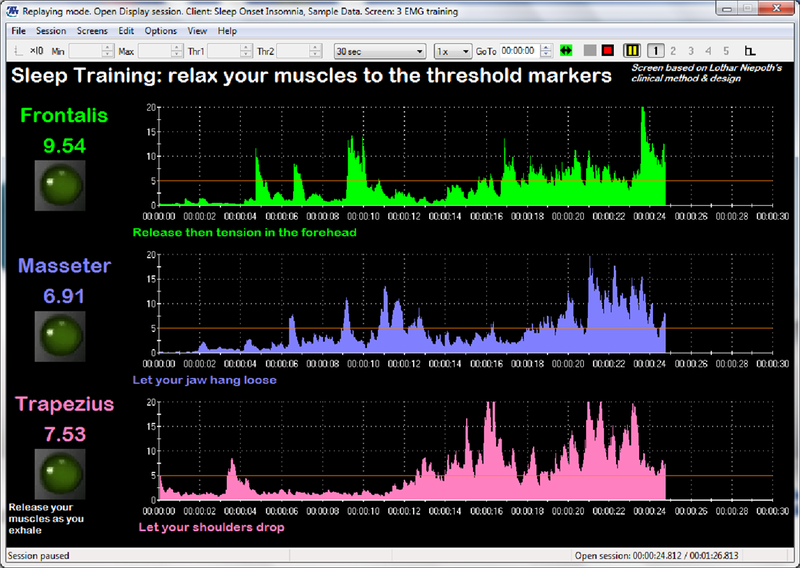 Tinnitus literature, questions and sample data are provided with the software. 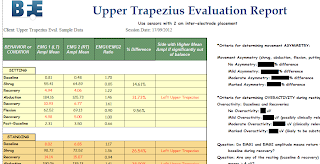 The Upper Trapezius Evaluation Suite provides an excellent, simple evaluation for upper trapezius asymmetry or over-activity with the use of surface electromyography (EMG or sEMG). It's based on research in pain by Susan Middaugh, PhD, and is applicable to clients that suffer from stress-related ailments (back pain, neck pain, tension headaches) or to athletes that need to maximize movement fluidity by avoiding upper body tension (especially golfers and goalies). The automated assessment guides the subject and therapist through 11-minutes of simple movement exercises. 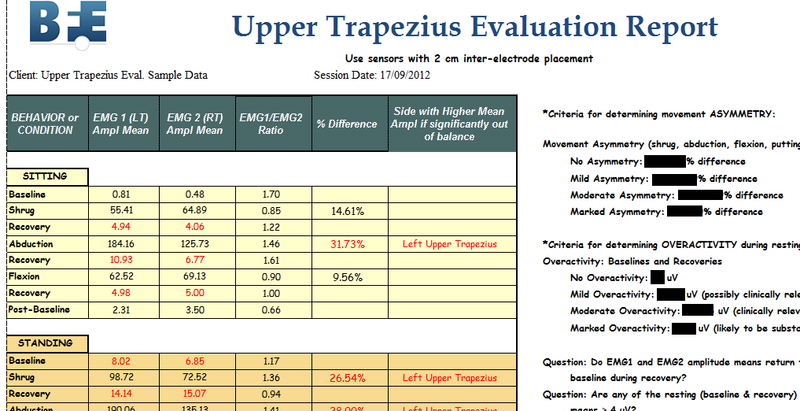 At the end, a report is generated with the relevant muscle tension means arranged in a simple table, with norms for objective data interpretation. Everyone occasionally has trouble getting to sleep. For clients that have more trouble than not, this suite's treatment style would be of help to them. In the Sleep Onset Insomnia suite, Dr. Lothar Niepoth shares his simple method for teaching clients to relax into sleep. Two methods, one for use with surface electromyography and the other for use with EEG, teach the subject to relax their body and relax their mind. 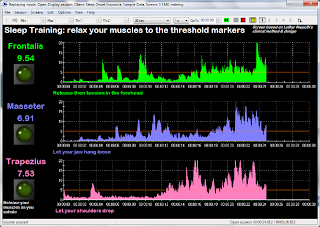 About 90% of subjects find the muscle work to be good enough for learning to get to sleep, while the other 10% find it necessary to do some EEG work. This isn't a technique that takes months of client coaching; just one to a few sessions and they are ready for a night's good rest. To learn more about these suites and the sensor and hardware required to use them, visit the software section of the BFE Online Shop. Once there, click on the individual suites download the tech sheets provided with the description of each suite. Please feel free to contact us at education@bfe.org with any questions you may have. This is a guest post by the BFE's Research Manager Jon Bale. 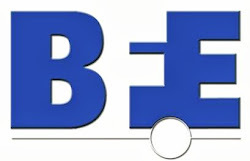 As the BFE's Research Manager, I spend most of my time moderating online sessions, teaching online classes, or guiding the software development of the BFE's suites. The opportunity to attend the 1-day Swingle Workshop at the end of May, held in Montreal, was therefore a welcomed change to my work in the digital realm. Facilitating the workshop also presented the chance to finally meet Dr. Paul Swingle in person. It's funny to think that with the 4 years of work Dr. Swingle and myself have done together - including the ClinicalQ & BrainDryvr Suite, Swingle Grand Rounds, Dr. Swingle's Webinar Series - we have never actually physically met. The 1-day workshop gave a brief introduction to Dr. Swingle's ClinicalQ & BrainDryvr method, but the majority of the day focused on the interpretation of ClinicalQ assessment results. Dr. Swingle dispensed of tips and advice for reading relevant statistics true to his personality: calm and direct, with a touch of humour. "Whenever you get elevated slow frequency in the front of the brain and elevated slow frequency in the back of the brain in a young person, smoking dope is the likely culprit. To be fair, in Vancouver it's already a 50 percent chance of being right when accusing a young person of smoking dope." Dr. Swingle's style of interaction was consistent with my experiences of him in our online sessions. Participants freely asked questions and referenced their own cases, all of which Dr. Swingle comfortably answered after a thoughtful pause. I did not see any appearance of his inner "New Yorker", with the rough and tough personality, that he enjoys mentioning about himself. Clinicians, including myself, seemed to be enamored with his breadth of knowledge. As one individual described him, "I am just in awe of Dr. Swingle and his work." Finally meeting Dr. Swingle was quite a pleasure for me, after all these years. In this video, he shares a few words about the workshop, his ClinicalQ and BrainDryvr software suite and the BFE. If you wished to attend Dr. Swingle's workshop, but could not due to scheduling constraints, please feel free to have a look at the upcoming BFE webinars being given by Dr. Swingle. While the workshop covered a wide range of clinical topics, his 1-hour online webinars each focus on a specific disorder. In addition, the BFE hosts monthly grand rounds sessions with Dr. Swingle during which participants can present cases to Dr. Swingle for review. Dr. Robert McCarthy is the author of the new Integrative Medicine software suite published by the BFE. We recently had a chance to ask him a few questions about his approach to Integrative Medicine. This is the final post of a three part series. What is the Integrative Medicine Suite? How do you see the Integrative Medicine Suite standing apart from other BFE suites? Well the thing that makes the Integrative Medicine Suite appealing is its incorporation of a voluminous amount of forms and assessment techniques and paper-and-pencil assessment techniques and practice structure that I know a lot of the other suites do not offer. One of the features of the suite is the Paradoxical Temperature Increase protocol. Could you talk a bit about that? The paradoxical temperature increase phenomenon has been observed and studied for a rather substantial period but has not gotten the focus that it really should. Paradoxical temperature increase is associated with trauma. It's a standard measure of post-traumatic stress disorder and also a measure of which medical patients are predisposed and at greater risk to develop psychophysiological disease. It's an objective measure to the degree at which someone has been adversely affected by trauma and victimized in some form or fashion during their developing and how it contributes to the predisposition to develop psychophysiological disease. Paradoxical temperature increase may also be a way of screening medical patients for who represents the greatest need group to get involved with biofeedback and other forms of psychophysiological treatment. The PTI Protocol looks for a paradoxical temperature increase marker, or PTI marker. What does it mean when an individual shows that marker? What's interesting is that the PTI marker is seemingly not modified by talk-therapy involvement. It only responds and disappears in reaction to biofeedback treatment. We need to do, in particular, peripheral finger tip temperature training and skin conductance work to really eliminate this marker. The question becomes, and time will tell as we do subsequent scientific research, the paradoxical temperature marker's disappearance in essence lowers our predisposition and risk for development of later-life psychophysiological disease. I suspect based on the research I have already done that is going to be the case in the future. Dr. McCarthy will be hosting a series on online sessions during which he will present case studies from his practice and share his expertise participants. Let’s use an interesting case for purposes of our discussion that I only saw two weeks ago. This mid-life woman woke up one day and felt her whole face was paralysed. She became petrified and immediately went to see her primary care doctor. Her primary care doctor referred her to a neurologist; the neurologist then evaluated this patient and referred her to an expert in myasthenia gravis. Loss of facial muscle control can be an early sign of myasthenia gravis. He then requested an MRI and concluded this patient did not have myasthenia gravis. It's at this point after extensive medical examination void of biological findings and financial expense that we usually receive referrals. You might imagine how happy these patients are at this point. No one has been able to figure out what’s going on so the conclusion almost always is either nothing, or a mental health problem. Once sitting down and talking with this patient at length, I learned something that no one else knew about because she never told them. In the six months immediately preceding paralysis of her face, she had received thirty botox treatments across her forehead from a local nurse. Her reason for not telling the other professionals involved in this case was two-fold: (1) the nurse who gave her the botox treatment said this couldn't possibly be the etiology of her facial paralysis; and, (2) she was embarrassed that she had done this to herself and that the physicians might scold or be critical of her. Such patient fears representing unresolved parent-child conflict, is not uncommon. In some research surveys, as many as 60% of medical patients admit to doing or taking things that they would never share with their physician for fear of being ridiculed, laughed at or dismissed. This ranged from cosmetic procedures to over-the-counter supplements, vitamin-based health fruit drinks, etc. In reality, what this means is that physicians are treating approximately 60% of patients blind-folded and without knowledge of their entire circumstances. We routinely do a detailed, comprehensive evaluation and learn a great deal about patients. We know from a lot of what we see on television, and in the media with movie stars, that it is possible to have adverse reactions to botox injections. There's even been a recent study that suggested botox crosses the blood-brain barrier and can potentially destroy neurons. Such information is certainly not being given to the public in terms of making a totally informed choice or informed consent. What other examples can you share about how your approach helped to address mind-body issues? Another case involved a client who went through $30k or $40k worth of medical tests, and everyone involved agreed that they could not find any biological basis for her symptoms. Physicians often make the mistake of telling people there is nothing wrong with them, rather than requesting integrative medicine consultation. In this particular lady's case, her hair started falling out, her gastrointestinal distress flared up, and she could not sleep. She then made the rounds starting with a primary care doctor, endocrinologist for blood tests and radiologist for a CT scan. People were genuinely concerned she might have some form of cancer. Once cancer was ruled out, she was referred to us for further consultation. Immediately upon talking to her she said: ”I came here because a friend of mine told me I need to, but this can't possibly be related to anything emotional.” The patient then proceeded to tell me she has a marriage that makes her want to pull her hair out. You get these dynamically-meaningful metaphorical statements from medical patients all the time. With minimal inquiry, she proceeded to tell me that her son, who was in his 20s, was jogging a few years ago, and dropped-dead of a heart attack. Even the autopsy was unable to determine the cause of death which still haunts her. She then told me about a host of other tragedies and trauma incurred over the course of her lifetime, but saw them as isolated incidents without any lasting impact on her well-being. In summary, she still harbored a tremendous amount of unresolved grief over her son’s death, exacerbating a chronic post-traumatic stress disorder developed during childhood when she repetitively witnessed an alcoholic father brutally beat siblings, but not her. People don't usually connect earlier life trauma with adult physical symptoms, but they are connected; and, physicians as a rule don't have the mental health background to connect these pieces of the puzzle. Even battered woman or men who are still being physically abused by their spouse don’t reveal these circumstances out of guilt and shame. Your integrative medicine approach seems to address many of the problems in today’s healthcare system. Why isn’t this approach the norm? The allopathic medical community, and there are exceptions, remains antagonist toward the integrative medicine field and any treatments that do not employ medication or surgery. Comparatively, osteopathic physicians having been trained to appreciate the multi-factorial complexity of health issues, and, in that sense, are aligned with mental health professionals as an outgrowth of training. This covert tolerance, sanctioning and condoning of the medical field’s antagonism and abrasiveness toward other health care professions, as well as frequent dismissal of valid scientific tools and treatment approaches like qEEGs, neurofeedback, biofeedback, etc. must stop. Patients being disempowered by being told that all their physical problems are genetic, they will need to take medication forever, and there is nothing they can do, without awareness or access to integrative medicine alternatives, remains a sad social injustice. I have a head-injured woman we are working with whose mother brought her to a regional medical center that specializes in head-injury treatment. This mother was so impressed by the changes in alertness she saw in her daughter, that she asked the doctor who was in charge of the entire regional medical center head-injury clinic, "Do you know anything about neurofeedback?" The specialist openly admitted she had never heard of neurofeedback. The patient’s mother then said, "Well I know Dr. McCarthy would be the kind of person who would be more than glad to give you information or talk to you about it". The physician looked up and said “I'm not interested in it and we have no interest in ever using it here". Now, that kind of response is extremely foreign to me because as a practicing clinician for the past forty years I’ve always been avidly interested in anything that holds some promise for helping patients. And that nicely sums up Dr. McCarthy’s commitment and dedication to providing the best possible care for his patients. The BFE is pleased to offer online Case Conferences during which Dr. McCarthy shares case studies from his practice along with his expertise in the field. To learn more about the contents of the Integrative Medicine software suite, click on the link below to view an introductory video. Any questions can be directed to the BFE Integrative Medicine team at reddrmccarthy@gmail.com.